Here is another recipe that is inspired by one from the 5-Day Detox we did. I liked her idea of mixing cauliflower rice with quinoa to make the rice layer of the sushi. It gave it more moisture and stickiness than just using quinoa. My sister followed her recipe pretty closely but I wanted to add more veggies to mine. This was the first time I was able to successfully roll nice looking cut rolls. I think I was inspired by the vegan sushi class we are taking on Saturday at Spork Foods in LA. 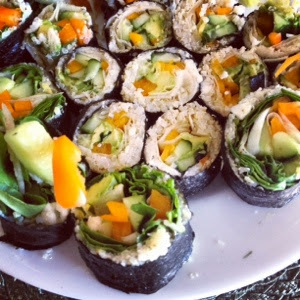 What is great about this recipe is that you don't need to have a bamboo sushi mat to be able to roll these (if you stuff them enough). I was quite pleased with the results and I definitely plan to make this more often. Blend the cauliflower till it is grainy and steam till soft but not mush. Cook the quinoa. While this is cooking, slice veggies into strips (I used a peeler to do the carrots which made an easy pile). Take one sheet of Nori and place it shiny side up. Cover 2/3 of the seaweed with cauliflower rice and quinoa. Add veggies to desired amount. If you want to add spinach, put that down first then put the veggies on top. Add optional basil and cilantro on top and/or a squirt of Sriracha down the middle. Wet the edge of the seaweed that doesn't have the "rice" mixture so it will stick to the other side. Start to roll. Go slowly if you need to to make sure it all stays in so you create a nice round roll. Cut with a sharp knife that with go through easily- otherwise the roll will fall apart.